Col. Joseph Hopson, paternal grandfather of Dr. Winthrop Hartly Hopson, moved from Henry County, Virginia, to Christian county, Kentucky, in the year 1811. His wife was Miss Sally Boyd, of Virginia. Their children were George, Morgan, Samuel, Joshua, Henry and Mildred. 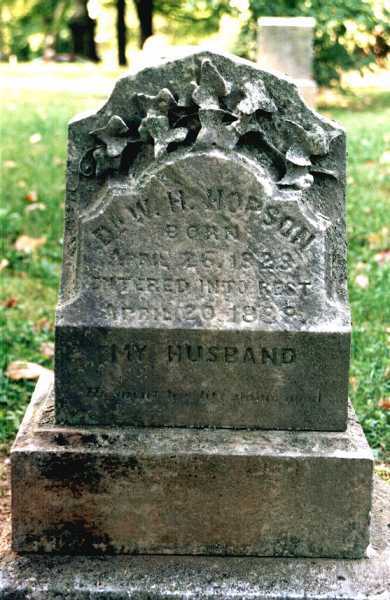 Dr. Samuel Hopson, the third son, was the father of Dr. Winthrop H. Hopson. His mother was the fourth daughter of Col. John Clark, who for many years was County and Circuit Clerk of Christian county. Dr. Samuel and Miss Sally J. Clark were married in 1818. They located near Garrettsburg. 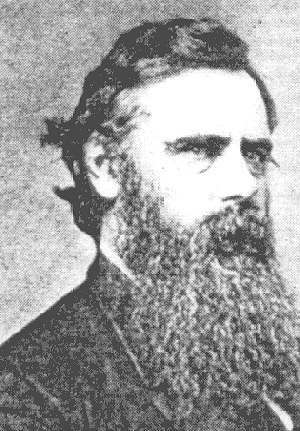 On April 26, 1823 Winthrop Hartley was born. When he was two years of age his father removed to Montgomery county, Missouri. Afterwards he settled in Fulton, Calloway county, and while living there attended the medical college of Transylvania University in Lexington, and graduated in 1825. At the age of eleven years his father sent him to Carrollton, Ill., to attend the school of Mr. Hinton, a Presbyterian minister, where he remained two years. Afterwards he spent two years in Jacksonville, Ill., in school. It was during this formative period of his character he was under the influence of such men as B. W. Stone, T. M. Allen, Joel Hayden, Marcus Wills, Absalom Rice, Francis Palmer and Wm. Davis. In Missouri these men were the pioneers of the greatest and grandest restoration since the days of the Apostles. The reformation of Luther took the church from creed to creed. The restoration preached by these men took men from human creeds and dogmas to the Bible. Having grown to manhood under the teaching which fell from the lips of these men, is it any wonder that he became the stern and uncompromising advocate of truth which he has always been? Dr. Hopson was always a good student. He commenced the study of Latin at eight years of age, under Prof. Dunlap, and at seventeen finished his Greek and Latin course under Profs. Roach and Thomas, at Columbia College, out of which grew up the State University, from which he afterwards received the degree of A.M. As soon as his school days closed, his father had arranged for him to enter the law office of Geyer & Bates, of St. Louis. At the same time, the brethren recognizing his ability to become a useful preacher, were urging him to enter the ministry. His father was not only proud of him, but ambitious that he should distinguish himself at the bar. It cost him a severe struggle to disappoint his father, as well as to silence the cravings of his own ambitions. On the one side were worldly honor, distinction, pecuniary profits, while on the other neither worldly glory nor emolument, but a hand to hand fight with contumely and reproach, persecution and poverty. But few young men who enter the ministry today can appreciate the sacrifice he was called upon to make. He decided to cast his lot with the people of God, and commenced his long and successful ministry at seventeen years of age. At the urgent request of his father, he studied medicine and graduated at the medical department of Missouri University, under Dr. McDowal, and practiced medicine six years, after which he devoted his whole time to preaching. Bro. McGarvey, in writing of him, says: "His discourses were methodically arranged, his argument convincing, his style transparent, and he left a line of light behind him as he advanced with his subject. His manner was bold and confident, without being defiant, and his action was full of grace and dignity. His voice was melodious and his person commanding. His exhortations, never boisterous, were full of tenderness, and they deeply impressed upon the heart the lessons set forth in the discourse. As a man, he was generous, kind-hearted and the soul of honor. His superiority, as, I think, in the case with which he comprehended a subject, and the facility with which he could distribute and arrange. In these particulars he had no equal among his fellow-laborers." Bro. Z. F. Smith writes of him thus: "By nature he was remarkably endowed. His brain, while not massive, was finely organized and supported by one of the most perfect physiques I have ever known. He was an orator by nature, not so much in the ostentation of rhetoric and the art of elocution, but in the natural simplicity and grandeur of logic and illustration, and in the pathos and sentiment of glowing words that touched the reason and the heart at the same time." Bro. I. B. Grubbs says of him: "If I am asked what I regard as the special feature in which the ministerial excellence of Dr. Hopson was manifested, my answer would be, in his matchless power of expression, the varying charms and well-sustained force of his diction, combined with the wonderful clearness with which he stated his positions and set forth his reasons to support them." G. A. Hoffman writes of him: "There are few men who impart such a high conception of true manhood. He was, first of all, a true man, and manifested the highest and most Christ-like ideal I have seen among men. True to his friends, true to his church, true to his conscience and true to his God." He first married Miss Rebecca Parsons, daughter of James Parsons. She lived only a short time. His second wife was Miss Caroline Grey, who after a brief married life left him with a babe five months old, now Mrs. R. Lin Cave, of Georgia. In the year 1850 he married Miss Ella Lord Chappel, who survives him. He was a devoted son, an ideal husband and affectionate father and kind master. His life work embraced a period of 47 years, in five states, with only nine ministries. I find a record of 5,000 additions, but there were many more not recorded. Thirty-eight years of the time I was his constant companion. Dr. W.H. Hopson is buried in the Mt. Olivet Cemetery, Nashville Tennessee. The cemetery is located at 1101 Lebanon Pike, Southeast of downtown Nashville. Click over to Mt. Olivet for map and location of the grave in the cemetery. His remains rest in Section SG2 - Lot #97, and are located just across the drive from his son-in-law, R. Lin Cave Please click on here for a map.